You can target 1 face-up monster on the field; discard 1 card, and if you do, increase that target's Level by 1. You can target 1 face-up monster on the field; monsters you control cannot attack for the rest of this turn, except Zombie monsters, also send 1 Zombie monster from your Deck to the GY, and if you do, increase that target's Level by 1. You can only use each effect of "Uni-Zombie" once per turn. This monster is an evolved version of Three-Legged Zombies. This card's name is possibly a multi-layered pun. Uni- in its name can refer to the fact that the two zombies work as a single unit to move around, as seen in the artwork of Three-Legged Zombies. More clearly seen in this card's Japanese name, this card's name is a pun between Uni-Zombie (ユニゾンビ) and unison (ユニゾン). 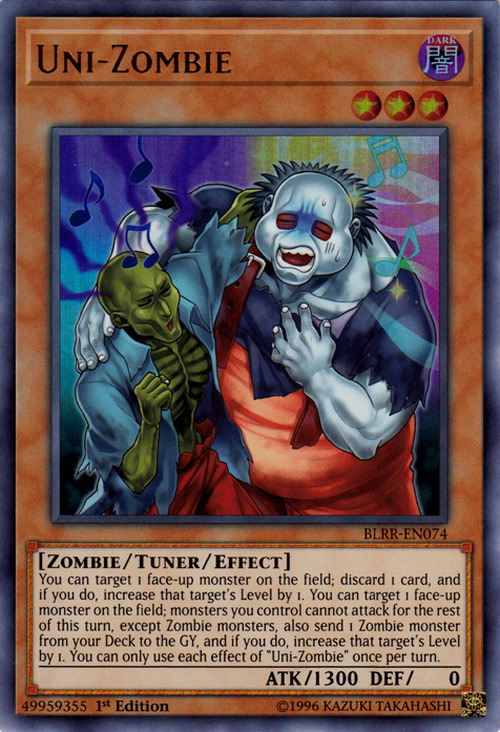 This is reinforced by the fact that the 2 zombies in this card's artwork are attempting to sing together.